It’s a hell of a time to spread misinformation in India—especially if you’re a member of parliament and a government minister. Indian MP Piyush Goyal, the country’s current railways minister, seems to have a history of sharing misleading information online. And now he’s under fire for promoting sped-up video footage of India’s fastest train in an apparent effort to hype-up its milestone debut. Later this week, Indian Prime Minister Narendra Modi is scheduled to inaugurate the operation of the Vande Bharat Express, the country’s first engineless train. It’s a fast train that has achieved speeds of 180 kph (112 mph) and is expected to run at 160 kph (99 mph) when it begins commercial services this month. But for Goyal (or Goyal’s social media team) it seems the train just isn’t impressive enough on its own. 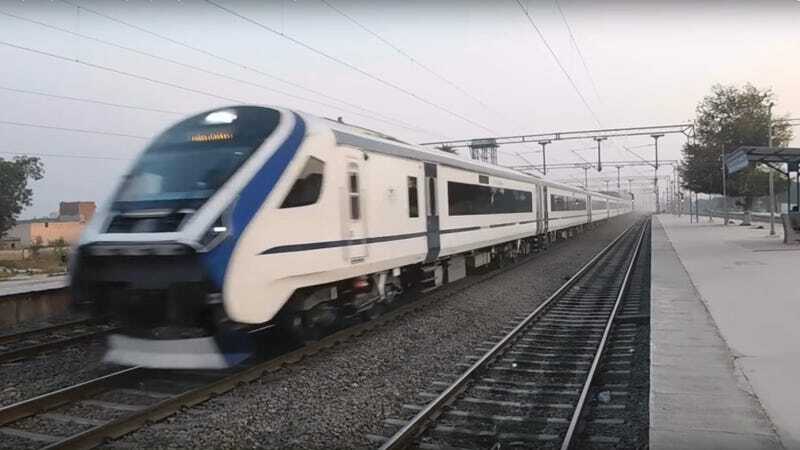 Last week, the minister tweeted a video of the train blowing through a station with the caption, “It’s a bird...It’s a plane...Watch India’s first semi-high speed train built under ‘Make in India’ initiative, Vande Bharat Express zooming past at lightening (sic) speed.” Indian outlet Alt News quickly pointed out that the video was altered to show the train going by at twice its actual speed. This kind of scandal seems petty and entirely avoidable, but it’s doubly-embarrassing at a time when the spread of false information on platforms like WhatsApp has resulted in mob violence in India while the Modi government is using fake news to justify potential internet censorship. In the replies to Goyal’s tweet, Twitter user Abhishek Jaiswal claimed that they owned the video and included a YouTube link of the same clip playing at normal speed. YouTube channel The Rail Mail did indeed post a longer version of the clip on December 20 of last year. What’s more, the higher-quality version includes a watermark that can vaguely be made out in Goyal’s lower-quality, high-speed take on the clip. Jaiswal later clarified that their intention wasn’t to seek credit for the video but to alert everyone to the fact that it was manipulated. “Reality shouldn’t be hidden,” they wrote. Alt News posted a side-by-side comparison Goyal’s upload and the original clip to demonstrate the obvious disparity between them. Goyal’s video embellishment could be chalked up to an innocent mistake if it weren’t for the fact that he’s been caught spreading false or misleading information online in the past. As the Guardian points out, Goyal made headlines in 2017 when he shared a photo of a Russian street to show off the Modi government’s progress in LED street lights in... India. That same year, Goyal used a dystopian image of a coal-mining facility to tout India’s efforts to reduce foreign imports of coal. The image, it turned out, was taken from an Amnesty International report that criticized India’s domestic coal-mining efforts and related human rights violations.